This is a 6-hour radio show in live by Maiko Jinushi (from Tokyo) and Mirna Bamieh (from Jerusalem/ Palestine). It will stream at 13:00-19:00, July 27, 2016. A 6-hour long conversation: On personal and collective anxieties, preoccupations, aspirations, and more. This year, Mirna started conducting different 6-hour durational performances, it started by a 6-hour auto-writing performance that was visible through live feed projection in a café in Marrakech, and now she will be having a conversation with me on the Radio live from Tokyo. Over the past month, we met regularly, discussing lives that felt worlds apart at times, and one-step away at others. Our practices are inspired by storytelling, and that was our starting point in a personal and professional friendship. In this performance we will be part of an unwritten script, that we’ll let play over us. I and Mirna met in Tokyo last month. She saw my film, then she contacted me. We met several times and talked various topics. We were born and grown in far different situation. After talking each other, we found both of us were interested in telling “personal tales” or “personal histories” on our artistic practices. We decided to do this live performance with a motivation to make this long long conversation as a storytelling rather than an ordinary talk. Mirna Bamieh is an artist from Jerusalem/ Palestine. She obtained a B.A in Psychology from Birzeit University in Ramallah (2002-06). M.F.A. in Fine Arts at Bezalel Academy for Arts and Design in Jerusalem (2011-2013). Ashkal Alwan Home Works study program in Beirut (2013/14). Her work attempts to understand and contemplate the ever-shifting politics, while equally questioning notions of land and geographies of in-between temporality. Recently, her work looks more at scenarios that take the language of the absurd and the ironical and uses them as tools for political commentary. In addition to that, she is working on developing works that create situational performances that use storytelling as a medium for creating a personal relationship between the participants and the artwork. 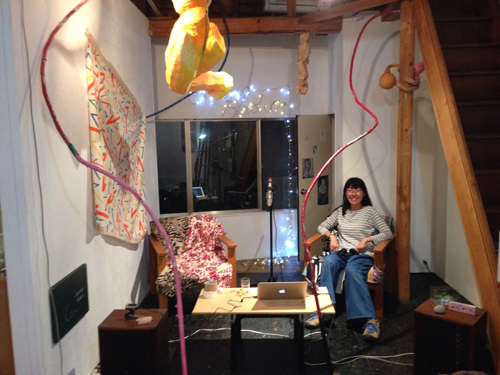 She is currently International creator resident at Tokyo Wonder Site. Maiko Jinushi is an artist from Tokyo. Jinushi obtained MFA in Painting from Tama Art University, Tokyo in 2010. Jinushi’s work has evolved from drawings and novels on the theme of personal tales to the creation of a “new type of literature” that comprehensively combines elements including video, installations and performance. Recent solo exhibition is “A New Experience of Love” (HAGIWARA PROJECTS, Tokyo, 2016). Recent group exhibitions are “RETURN TO: TWS Creator-in-Residence 2015-2016” (TWS Hongo, Tokyo, 2016), “Unusualness Makes Sense” (Chiang Mai University Art Center, Chiang Mai, 2016), “Zero Gravity ” (Matadero Madrid, Madrid, 2015), “Fictive Communities Asia – Koganecho Bazaar 2014″ (Kanagawa, Japan, 2014).